Whether you are a business person trying to get more sales, a manager trying to find the right hire, an IT employee trying to write new software, or just the average Joe trying to get the most out of existence, your life will be a lot easier if you understand some basic principles in the art of persistence, determination, and influence. You must understand that the world doesn’t revolve around your timing; you revolve around it. And just like a farmer understands the timing of a seed and will not expect it to sprout any sooner; understand that some doors will open at their own time and not any sooner. 2. Reasons make more sense on paper. From time to time, you might grow weary. If this happens, it’s because you are getting too caught up on the mere routine of knocking on doors. It is easy to get discouraged and lose hope when you lose sight of what initiated your quest. It helps to have a list of at least 10 reasons why you must get through this particular door. Keep this list in a place you see frequently like on a refrigerator door, bathroom mirror, or even in your wallet. This will fuel your daily knocking with purpose. Just as you would probably regard a couple of soft knocks in the middle of the night as someone knocking on the wrong door and ignore them, your knocks — if done reluctantly and infrequently — will also be ignored. Your frequency and loudness will broadcast a message about whether or not you believe you are knocking on the wrong door. Conviction is contagious. Increase the frequency and loudness of your knocks, and this will convey conviction, which will open more doors. If you are ever concerned about turning off a prospect, look back on specific instances when someone in the past rejoiced at the fact that you didn’t give up on them. It’s also helpful to remember that those who like you will like you no matter what you do, and those who dislike you would have disliked you anyway. Before you knock on any door, repeat this statement aloud and with enthusiasm at least 10 times: “Whatever brought me to this door I am currently knocking on understands that somehow I possess something of immense substance which only I can deliver.” At times, affirming yourself is more important than the actual act of knocking for the frequency of your state of mind usually arrives days before you ever get to any door. If getting through the current door you are knocking on will help you create relationships that will make your wildest dream come true, would you ever stop knocking on this door? Perhaps the only thing missing right now in your life is the fact that you are not treating whatever door you are knocking on as such. Believe that something bigger than yourself brought you to this door. And remember that faith is the beginning to every accomplishment. Knock on every door today with extreme confidence as though a positive response is awaiting you. 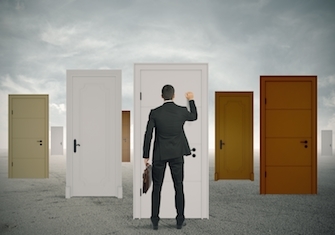 Approach the day as though the opportunity of a lifetime is right behind one of the doors you are going to be knocking on and since you don’t know which door it is, treat every door with the upmost respect. When all else fails, remember to be patient and that not now doesn’t mean not ever. These concepts can be summarized with Calvin Coolidge’s statement: “Nothing in this world can take the place of persistence. Talent will not; nothing is more common than unsuccessful people with talent. Genius will not; unrewarded genius is almost a proverb. 5 keys to stay determined.